In Time Runners the TimeWeb is up and running and the children can begin their work as Time Runners, helping Mortlock to defeat the Virans. 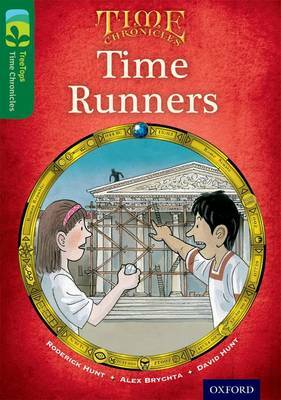 But their first mission to ancient Rome shows they still have plenty to learn Biff, Chip, Kipper and friends are older now and their true destiny is about to be revealed... Can they stop the evil Virans from destroying history as we know it? The Time Chronicles are exciting chapter books following your favourite characters on a series of adventures through time. These captivating stories feature familiar characters in fast-paced adventures to engage children. The missions feature real historical events and characters, fascinating facts and thrilling plots. Children will love reading these language-rich adventures. Books contain inside cover notes to support children in their reading. Help with children's reading development also available at www.oxfordowl.co.uk. The books are finely levelled, making it easy to match every child to the right book.